Not to be morbid...but...I'd like to talk a little about palls. I'm sure that just about everyone reading this post knows what a pall is. So for the one or two people who are unsure, I'll offer a few tidbits of information. The primary definition is that a pall is a piece of cloth used to cover a casket during a funeral. A secondary definition is that a pall is a small, cloth covered square of card used in Catholic church services to cover a chalice holding the Eucharist. This post is concerned with the first definition. The pall covering a funeral casket developed out of the funerary shroud, a piece of cloth used to cover an embalmed body of a deceased person during the Greek and Roman Classical Periods. (The most famous being the Shroud of Turin.) In fact, the name comes from the Latin word, pallium, meaning a "cloak". In a sense, the pall "cloaked" the casket. During the Medieval Ages and through the Renaissance, funeral palls took the form of lavishly embroidered cloths, often bearing the deceased person's armorial achievements as a design. After the deceased was laid to rest, the fancy palls might be retained by the surviving family members and used for wall hangings. As the centuries passed, the palls became solid black, known in Scotland as a mortcloth; eventually they were simple, solid white cloths, symbolizing the resurrection of Jesus, the Christ. In some cases even into modern times, the white cloth might be decorated with a cross in some color. And in some cases, such as in that of a military funeral, the national flag is utilized as the pall. The photo at the head of this post is of the pall used on the casket of my father, Bernard R. Smith. In a military funeral, the flag that is used as the pall is removed from the casket before the casket is lowered into the ground. 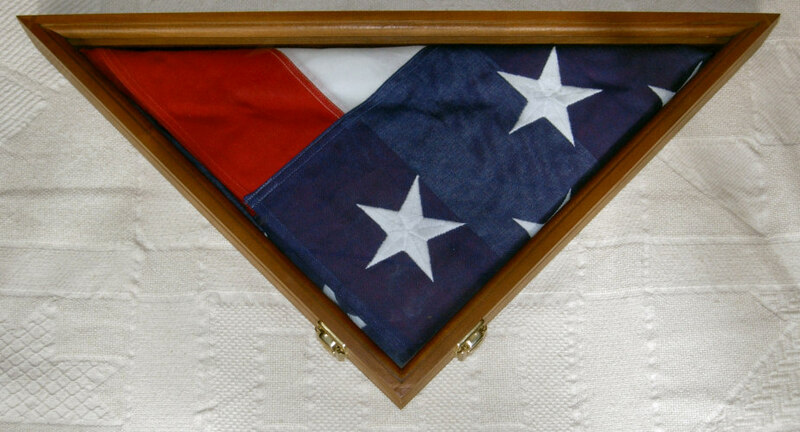 The flag / pall is folded into a triangle and then presented to the surviving family members. In situations in which plain cloths are utilized for the pall, they are not presented, as a flag, to the surviving family, but instead retained and used in the funeral of other individuals. The pall-bearers at a funeral are the persons who carry the casket from one point to another. In some cases, such as where the cemetery in which the deceased will be interred adjoins the church, the pall-bearers might carry the casket directly from the church to the cemetery plot. In other cases, such as where the memorial service is held at a location some distance away from the cemetery, the pall-bearers might simply carry the casket from the church to a hearse, and then from the hearse to the cemetery plot. And in effect removing the pall-bearers completely from the task for which they are named, a modern funeral might involve the pall-bearers simply walking behind the casket, which, being rested on a wheeled cart, may be pushed along by the funeral director. In either situation, if there are certain individuals designated to bear the casket and others to bear the pall, suspended a few inches above the casket, the former are specifically called casket-bearers to differentiate them from the actual pall-bearers.